At quarter past midnight . . Alcock stood up in the cockpit, reached forward with his hand to DIG his fingers into Brown’s shoulder . . personal excitement . . somehow arching . . through powerful fingers. Dug ’em in . .HARD ! . .As he pointed . . UP ! There’s VEGA AND . . POLARIS ! Like a shot Brown was kneeling on his freezing seat . . clumsily twisting sextant knobs with numbed fingers. Then he spread out his navigation tables . . pinning the paper with one elbow . . while calculating the Vimy’s position using their very expensive flashlight . . ‘ dumbing down ‘ with a primitive . . fast fading battery. Ten minutes later, using an . . encouragingly small . . resulting navigator’s triangle now penciled on his map . . Brown estimated their position as . . 50 degrees 7 ‘ North Latitude. And 31 degrees West Longitude. Completely trusting his ever-faithful star ‘ companions ‘ . . Polaris and Vega. They’d completed 850 nautical miles with their ground speed enhanced by a little cross and tail wind factored out to 106 knots. But . . roughly 1,000 open water miles of dark Atlantic . . still lay ahead. ” I looked towards him and I noticed that he was singing. But I couldn’t understand a word. It turns out, in Brown’s ebullient and joyful voice . . had to do with visual imagery . . after having a touch of whiskey. In London Daily Mail’s newsroom, early AM discussions about the Vimy were gloomy . . edged with apprehension. The under ocean cable from St. John’s had announced the Vimy’s takeoff . . But then nothing. 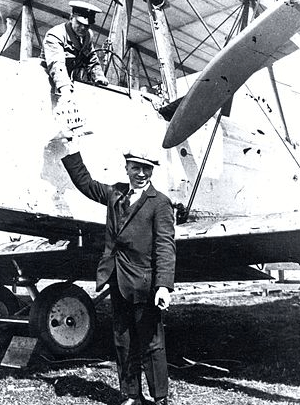 The news room knew the surplus WW I aircraft had a radio transmitter . . but they were not aware the radio’s batteries went dead just a handful of hours after take-off. 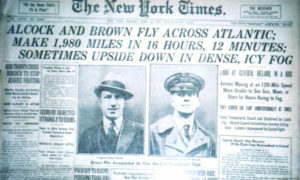 Dispatches from around the world piled up – not one suggesting Alcock and Brown might ‘ pull it off.’ And earn the Daily Mail’s £10M prize to be the first gutsy first aviator(s) to fly non-stop across the Atlantic Ocean. The fliers thought they saw the promise of pre-dawn. Then in the increasing light . . they were stunned by looking at a . . cheese-like solid wedge . . of dark blooming cumulonimbus storm clouds . . directly in their narrow navigational track. The ‘ weather devil ‘ once again placed himself precisely in the way of their finite gasoline load . . on their fuel inflexible flight path. As soon as the converted bomber penetrated the dark anvil . . its rough turbulence . . seized their machine. Flung it to . . the extreme edge of pilot Adcock’s skill and control. Alcock and Brown were pressed down into their seats and deluged by rain and hail. Now pacing their airspeed with up and down ver-tical moves . . as the mature thunderstorm . . gifted nasty thousands of hail stones. And more and more ice layers. The impressive snare ‘ drum ‘ pounding of hail was ignored . . as Alcock struggled to regain control. But in the persuasive grip of strong ‘ seat of the pants ‘ feelings ‘. . he mistakenly followed his vertigo-induced mental perception . . to falsely believe . . he had somehow ‘ lucked into ‘ a just a ordinary power dive. He seriously reduced both engines’ RPMs and , So the out-of-control Vimy plummeted less rapidly . . but it soon dove lower than one thousand feet above sea level. Seconds later, a startled Alcock eyes snapped wide open at the ocean’s reflected black horizontal surface . . impossibly appearing . . as a s-t-u-p-I-f-y-I-n-g . .DOWN AND UP . . V-E-R-T-I-C-A-L L-I-N-E . . not just the routine horizontal line ! D-=E=A=-D M=-A=N’ S S=-P=-I-=R-=A=-L ! 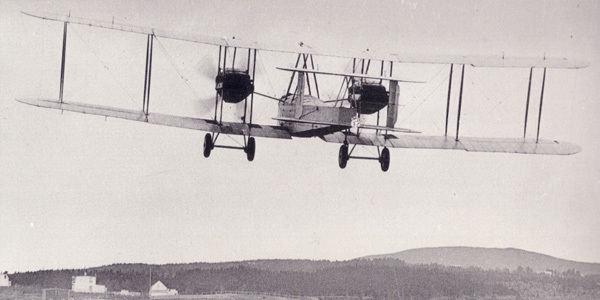 With a quick intuitive non-stupified reflexes, Alcock muscled the bi-plane’s quadruple wings back to level flight . . while simultaneously ramming both throttles to Vimy’s firewalls. On the other hand, Brown’s mind was whipping around angrily : ” I kept thinking about how horrifically wrong that ignorant and stupidly wrong weather meteorologist had been. The incompetent bloke had even failed to perceive . . the heavy snowstorm the Vimy was now about to ‘ poke their nose ‘ into. As well as their recent nasty gift surprise . . of night ‘ goop . . then their not quite smacking down into a middle Atlantic’s white-tipped . . night cross-hatch of swells. Now . . a third nasty gift from the clouds. Frost-colored rime ice began piling up on the Vimy’s wings . . on its fuselage . . its landing gear . . struts . . and tail empennage. With seeming black magic . . ice began redesigning the engines unprotected carburetor air intakes. Also the ice began melding the tail ‘ hinges to with the adjoining elevators. While melding the Vimy’s vertical tail fin hinges to its [ incredibly important ] rudder. on one rudder pedal . . then the other one. Unless both flyers quickly energized to make drastic additional . . as the hinged controls were now locking in place ‘ by the accumulating coats of rime ice. Navigator Brown’s realization of their approaching death became stark . . as both engines suffocated . . and what would happen next. He knelt on his seat, carefully removed his goggles and secured them. Then he raised up and carefully leaned out the cockpit to more specifically observe each engine nacelle’s worsening ice load. In addition to slowing them down . . the rime ice was now frighteningly covering over both engines’ . . hyper critical engine air intakes. Then, as far as Brown was concerned, their only way to avoid being forced to ditch in the middle of a frigid sea, was for him to climb out on each ice-laden wing – right now – and make personal ‘ one-on-one ‘ visits to each engine. He grabbed up his heavy knife . . held it tight . . raised his war uninjured leg over the cockpit edge . . placed each boot sole . . precisely in front of the nearest vertical wing strut . . at the attachment point on the rime ice-covered wing. In alarmed disbelief . . not knowing the urgency of his navigator’s behavior . . Alcock reached over and seized Brown . . attempting to hold him in the cockpit. Brown violently jerked away . . then wriggled his way out on to the struts and flying wires . . as he carefully clasping his heavy work knife. Out in the freezing near 100 mph slipstream . . Brown was impaired by a leg not yet healed from his war wounds . . he carefully moved from strut to strut – and flying wire to flying wire. Carefully squirming around, Brown then cautiously ‘ chip clean ‘ the rime ice closing up the fuel inspection window. As the prop wash and slip stream tugged incredibly hard . . a bitterly cold slip stream . . ‘ sneaked ‘ in . . to nibble at the navigator’s newly exposed body flesh. Brown completed the urgent mission to each engine . . then carefully wormed his way back into his open cockpit. But . . soon it was again time to wrestle himself and incredibly precious blade back out into the . . ‘ wild ‘ surfaces . . out on the Vimy’s ice covered wings. Alcock had more than enough to do . . himself . . just to smoothly fly the open cockpit biplane with his ‘ velvet glove ‘ finger tips. One clumsy stick movement on his part . . Brown’s life would be snuffed . . to become flotsam and jetsam on the open Atlantic. Not one of his extremely careful boot sole placements on the iced wing’s surfaces . . nor one thoughtless grip of Brown’s numbed fingers . . was free from risk. But with a fierce desire to live, Brown repeated his personal acrobatics . . wrestling the biplane’s . . struts . . flying wires . . against the fiercely cold slipstream. Four ( 4 ) ‘ bloody ‘ times. 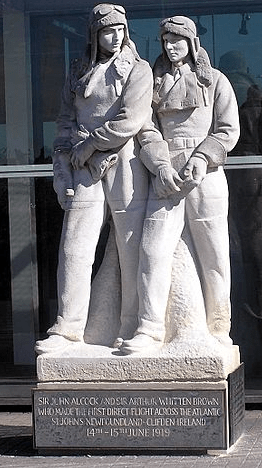 In the pre-dawn light, the Vimy’s elevator and rudder controls were only moving within the limited arc of the ‘ ice vice.’ While cruising at 11,800 feet, the Vimy temporarily broke out and cruised on top of the clouds, as a cold sun shone directly their faces. But he had no idea . . what point on England’s coastline they would cross. 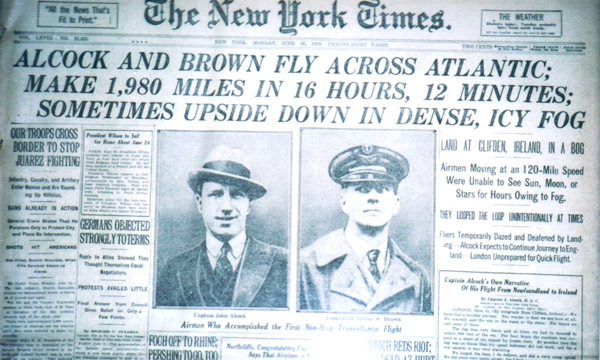 It had become obvious, they were compelled to descend into warmer air to preventing further ice accumulation of additional ice . . unreachable with Brown’s personal acrobatics. As they were descending, Alcock kept his eyes glued to the unwinding altimeter. While continually cross-checking and reacting to numbers ‘ jostling around ‘ in the fluid compass. The Vimy broke out of the warmer cloud layer over a rough-surfaced ocean. And within minutes, the triumphant flyers sighted land. From one of his maps, Brown recognized a landmark . . next to an identifiable town. Alcock circled the town searching for a place to land . . on an outlying meadow . . then turned toward a promisingly spot . . near the town’s radio station. The Vimy’s engine noise sent workers running outside where they leapt ’round in a high level of astonished excitement. while others became like statues . . stupefied with shock. Then all of them audienced aviation history . . as Alcock glided the Vimy down toward an innocent- appearing green ‘ meadow ‘ nearby. For beneath the deceptively smooth surface . . was a boggy marsh. Alcock thought the people were waving a them welcome . . instead . . of a warning. 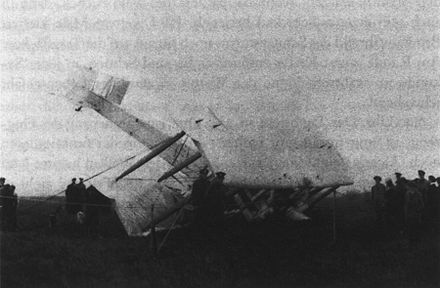 So he plunked the Vimy down into the bog . . where it plowed a short four- track furrow . . before burying its nose . . ingloriously upending . . angled steeply down . . tail wheel pointing skyward . . in the slime of a greenish bog. But the World’s first Atlantic air mail letters and small packages . . did not get soaked . . the now precious treasures were not even muddied up. And the grinning aviators . . were just fatigued and wet. Alive . . and uninjured. After 1,890 miles and 15 hours 57 minutes, two authentic aviation heroes . . were momentarily hanging forward from their seat belts . . looking like two weather-beaten disheveled dolls. News of their adventure spread like burning wildfire. The two aviators received a justifiable heroes’ welcome in London. A young Winston Churchill himself presented Alcock and Brown with their £10,000 Atlantic crossing prize. The two were knighted during large ceremony . . by Great Britain’s King and Queen. Afterward, Sir Brown headed out on a honeymoon. While Sir Alcock accepted a job flight testing a new amphibian aircraft. One of Alcock’s duties was to deliver new amphibian aircraft. And one putrid day Alcock should have postponed a ferry flight to France. He was considered by many as the finest aircraft pilot in the World. And his ego perhaps insisted he was able to ‘ winkle around any kind of weather. ‘ But of course . . make it through. Low clouds, poor visibility, rain and strong winds threatened any successful aircraft delivery to Paris . Others were reluctant to go along with him. So he choose to fly solo . . jumped in the brand new amphibian airplane . . headed for the English Channel. After reaching the Normandy coast . . he chose to fly close above France’s trees. Then 40 miles further along . . something bad happened. A French farmer working his fields . . witnessed Alcock’s new amphibian aircraft falter sideways . . then smack into the ground. The farmer reported : “ I looked up and saw a plane become unsteady – make big sideways sway . . then fall. I ran over to the crash and found the pilot in a banged up terrible mess and unconscious.” Alcock was carried to a farmhouse, as someone ran to flag down a truck on a nearby dirt road. But no trucks. But eventually contact was made with the hospital and doctors made it to the farm house. They were too late. And after having been administered final rites by a local priest, Alcock made his final flight departure. Many years later . . as an oldish man . . Sir Brown died in bed. Source : Abridged . . from Aviation History On-Line Museum archives.